Much like dogs, all HVAC units go to heaven—it’s only a matter of time. In this blog, the Fredericksburg HVAC specialists will show you a few signs that it’s time to lay your old, busted HVAC unit to rest so you can replace it with a newer model. Your HVAC unit is making strange noises. When it comes to the health of your HVAC system, it’s best to play it by ear. You know what the hum of your HVAC unit sounds like on a daily basis—so when you start hearing unexpected and strange noises coming from your unit, it’s best to have it checked out by a professional. New noises coming from your HVAC unit aren’t necessarily cause for panic—you might just need new filters or a system tune-up. But if your HVAC unit is starting to sound like a chainsaw or a ‘62 Camaro, it might just be time for a unit replacement. A repair on your HVAC unit every now and then is one thing—HVAC units are subject to Murphy’s law just like everything else. But if your HVAC unit is breaking down frequently, you might be in need of a new HVAC unit altogether. Think about it this way: let’s just say, for this example, that every HVAC repair costs $200 for parts and labor. If your HVAC unit keeps breaking, and your Fredericksburg HVAC repair guy has to stop by six times over the course of two years, you’ll have spent $1200 on HVAC repair—which is pretty close to the cost of a brand new HVAC unit. Add in the fact that an old HVAC unit is less energy-efficient than a new one, and you’re spending more money to keep your old HVAC alive than you are to fork over the cash for a new one. This is math just about any homeowner can understand. While it might hurt to shell out the money for a new HVAC unit up front, it’ll save you a lot of hassle—and a lot of money when your energy bill comes in the mail. Your energy bill keeps rising. Small spikes in your energy bill are usually not an issue, especially when winter rolls around, or when you haven’t had your HVAC unit serviced in a while. But if your energy bill keeps rising, even with regular HVAC service, you might have a larger problem on your hands. The older your HVAC becomes, the more effort it takes for components of your system to work at their best. This is when you start seeing increases in your energy bill that can bust your budget—and to make matters worse, you’re probably not getting the quality of air that you’re looking for, either. Replacing your HVAC system with a newer, energy-efficient model can save you up to 15 percent per year on your energy bill—savings that will help your new HVAC system pay for itself. Call the Fredericksburg HVAC team! 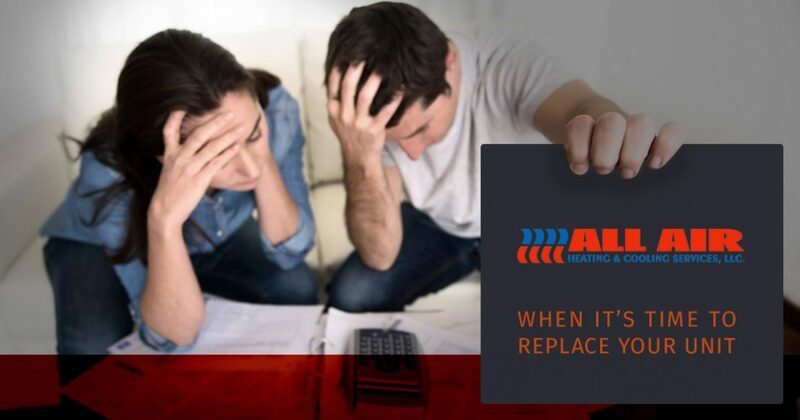 If your HVAC unit is breaking your bank, it’s time for a unit replacement. That’s where the All Air team can help. With over two decades of experience, All Air can help you with preventative maintenance, routine tune-ups, and full-on system replacements. Get in touch with All Air today!